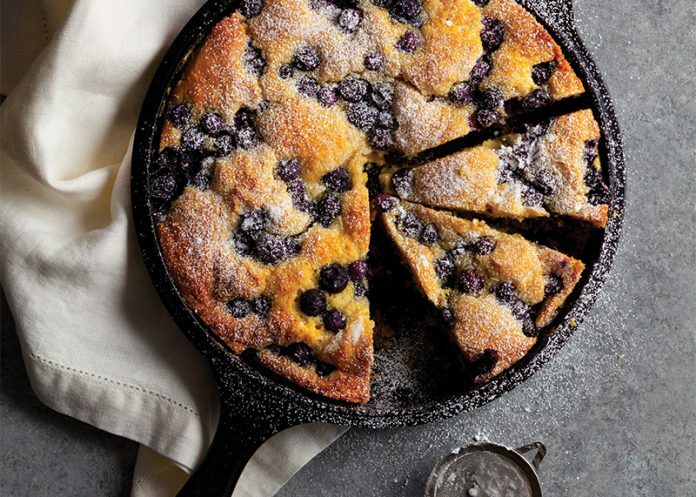 Fresh blueberries and a hint of lemon zest give this Blueberry-Cornmeal Skillet Cake a bright flavor, while the cornmeal adds a rustic texture. Serve it as dessert or alongside breakfast. Preheat oven to 350°F. Place a 10-inch cast-iron skillet in oven to preheat. In a large bowl, stir together flour, 3⁄4 cup (150 grams) granulated sugar, cornmeal, salt, baking powder, baking soda, and zest. In a medium bowl, stir together 8 tablespoons (112 grams) melted butter, sour cream, eggs, and vanilla. Make a well in center of flour mixture. Add butter mixture, stirring to combine. Carefully remove hot skillet from oven. Add remaining 1 tablespoon (14 grams) melted butter, swirling to coat. Add half of batter to pan, spreading in an even layer. Sprinkle 1 cup blueberries over batter. Drop spoonfuls of remaining batter over blueberries. Sprinkle with remaining 1 cup blueberries and remaining 1 tablespoon (12 grams) granulated sugar. Bake until a wooden pick inserted in center comes out clean, about 35 minutes. Let cool on a wire rack for 30 minutes. Garnish with confectioners’ sugar, if desired. Would I be able to use my sourdough starter in this recipe – if so what changes should I make in the ingredients? Thank you for reaching out! We do not suggest using your sourdough starter for this recipe- the way the recipe is designed, we do not think you would have success using your sourdough starter. Thank you and happy baking!